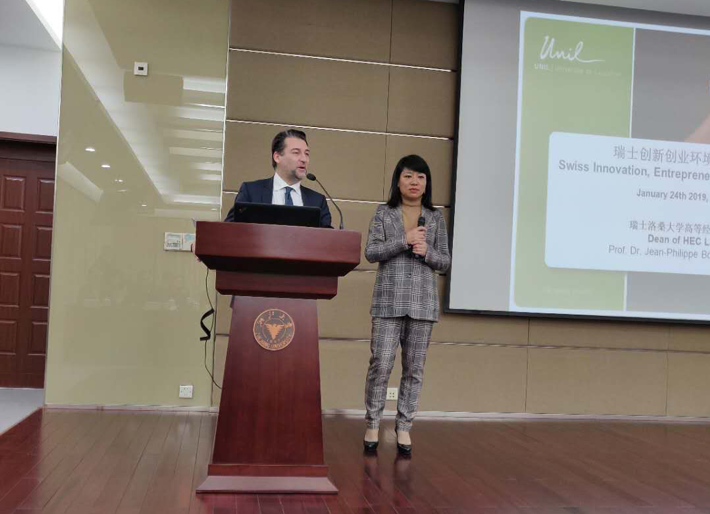 On the 24th of January, swissnex China participated in an Innovation and Development Dialogue between Sino-Swiss Enterprises and the "Opening Ceremony of the China Economics and Finance Center" in Hangzhou (Zhejiang University). The center was been co-created by Zhejiang University in collaboration with HEC Lausanne and EPFL (Ecole polytechnique fédérale de Lausanne). After an introduction to the China Economics and Finance Center (CEFC) and Opening Ceremony performed by Dr. Matthew Wang, Chairman & President of Cybernaut (China) Investment and Executive Dean of ZII. Pr. Dong from HEC Lausanne offered a traditional Swiss bell with the colors of the University of Lausanne as a symbolic gift. During the forum, Prof. Jean-Philippe Bonardi, Dean of HEC Lausanne - The Faculty of Business and Economics of the University of Lausanne showed us the key Swiss trends in innovation, entrepreneurship and global trends. He stressed the importance of promoting an entrepreneurial spirit in our universities. Prof. Rongxiao, Dean of the Industrial Technology Transformation Research Institute at the University of Zhejiang, then demonstrates all their efforts to create a great innovation ecosystem, and develop a win-win model for industry-university-research. Mr. Bo Ji, Chief Representative for Europe and Assistant Dean at Cheung Kong Graduate School of Business. He aims to provide European businesses with executive training to understand China and how to successfully do business in this dynamic market. This experienced TEDx Speaker gave us a speech as well. We concluded the morning with a round table discussion on "The Digital Age, the New Model for Innovative Cooperation between Sino-Swiss Entrepreneurs" with directors, representatives of institutions and entrepreneurs. Prof. Minyue Dong and Mr. Victor Dietrich from swissnex China represented the Swiss side. swissnex China had the opportunity to present their activities and how they help build bridges between China and Switzerland in the field of innovation, sciences, and education. During this discussion, interesting ideas were raised such as making the data public to generate more rapid innovations. This new center also generates a lot of prospects in establishing new partnership between China and Switzerland.